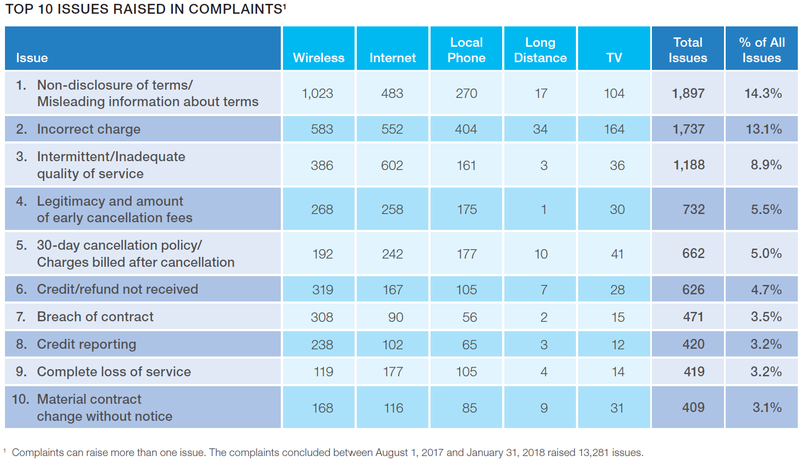 The Commission for Complaints for Telecom-television Services (CCTS) received a record number of complaints last year, but also recorded fewer breaches of its Wireless Code, according to the organization’s 2018-mid-year report. Released today, the report reveals that CCTS accepted 6,849 complaints between August 1, 2017 and January 31, 2018 – a 73 per cent spike over the same period the year before. The organization acknowledged that its newly expanded mandate was at least partly to blame, with TV service complaints being accepted as of Sept. 1 and representing 846 complaints. Meanwhile, there were fewer breaches of the organization’s Wireless Code than during the same period in 2016 – 43 versus 52. In an April 10 statement, CCTS commissioner Howard Maker said his organization was as surprised as anyone else by the increase in customer complaints, noting that it was experiencing some delays in processing times. Service providers who fall under CCTS jurisdiction are obligated to refer to the organization on a customer’s bill, he noted – and the fact that the increased number of complaints is spread across wireless, internet, and landline and television services is a good indication that customer awareness is increasing across the board, he said. Bell remained the largest source of complaints, representing 2,275 – or 33.2 per cent – of customer complaints recorded, more than three times the number posted by Rogers, which came in second with 707 complaints, and more than four times the number of complaints against Telus, which received 511. Altogether, the big three wireless providers accounted for 51 per cent of all complaints, according to CCTS. “It’s surprising the commissioner highlighted Bell as having the most complaints considering we do have the most customers by far and our proportion of overall complaints continues to decrease more quickly than our competitors,” the spokesperson wrote in an email. “The CCTS mid-year report shows that we have 511 opportunities for improvement and we will take these customer complaints, along with the feedback we receive from our customers every day, to heart,” she wrote. The organization also received (but did not accept) more than 5000 complaints falling outside its mandate, regarding issues such as customer service, broadcasting, pricing, and unsolicited marketing. 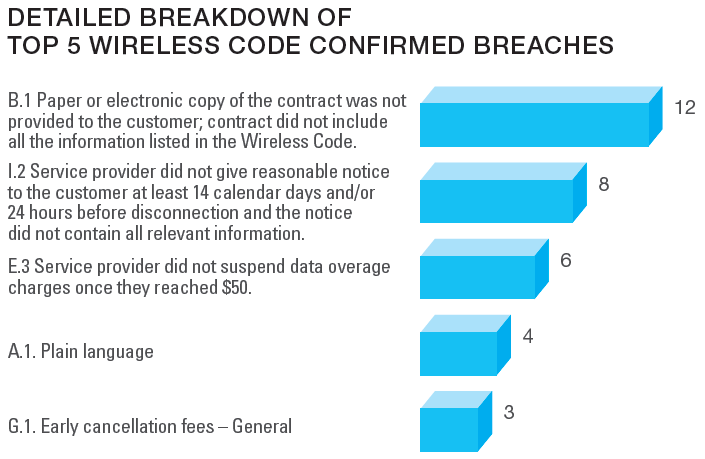 As for the CCTS Wireless Code, Maker noted that not only did the number of breaches go down, but the percentage of investigations that turned out to be breaches dropped as well, from 31 per cent to 24 per cent. 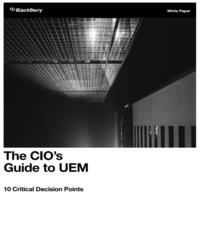 The top three confirmed breaches involved providers failing to give customers reasonable notice that their contracts were being terminated; wording terms and conditions in a way that did not comply with the Code; and breaching data overage standards by failing to suspend charges over $50. In its report, CCTS was also quick to note that despite the significant increase in complaints, it quickly resolved the majority of them – of the 5,202 complaints resolved, 4,604 of them – or 88 per cent – were resolved at the pre-investigation stage (within 30 days).